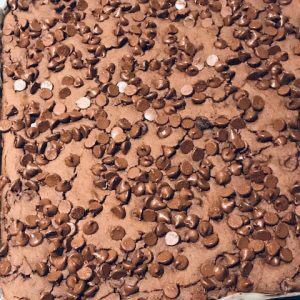 Fudgy Black Bean Brownies....with PLENTY of chocolate! Brownies should be decadent...and really NOT healthy at all. However, sometimes a sweet tooth just lingers and you look for something that will satisfy it with out any guilt attached. Enter THESE brownies. Gluten-free (naturally!) and full of chocolate. Take one to work, have one for dessert or pack them in the kids lunch bag...but omit the nuts! You can't believe it's beans?? I know (wink). Preheat oven to 350°F. Grease an 8-inch square baking pan and line with parchment paper. Combine beans, eggs, oil, chia, cocoa, salt, vanilla and sugar in food processor. Puree until smooth. Remove blade and stir in all but 2 tbsp chocolate chips and walnuts, if using. Pour mixture into prepared pan and top with reserved chocolate chips. Bake for 30-35 minutes, or until just set in centre and toothpick comes out mostly clean, with a few crumbs still stuck. Cool completely. Refrigerate for 2 hours before cutting into bars. Feel free to blend in a Vitamix or other high-powered blender. You'll just have to work at scrapping it all out. The batter must be smooth, so simply mashing the beans with a potato masher or back of a fork just wont work.